A group of students in a visual journalism course at the University of Miami interviewed industry leaders about the concept of multimedia journalism. They spoke with journalism professors and working professionals from the New York Times, NPR, MSNBC and other outlets. The resulting website, Multimedia Standards, provides expert opinion on the definition of “multimedia,” what it takes to make successful interactive narratives, and what they think the future holds. The idea behind the site you’re currently reading, Modern Journalist, is to give my class (WRI 430) a place to experiment, to share what we’re learning as a way of practicing online publishing. A site like Multimedia Standards helps not only the class that creates it, but both the teachers and students who follow. 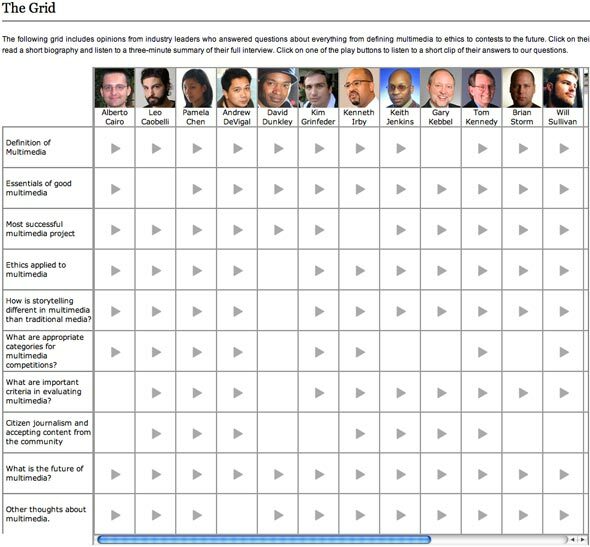 After challenging students to define multimedia journalism, I detailed their first hands-on exercise: create an audio podcast using clips from the Multimedia Standards grid. In addition to the challenge of thinking critically about multimedia in journalism, the first part of the exercise introduces important technical concepts about how the Web works. To find the audio filename in the source code, you first have to understand the basics of what the code is doing. The <body> tag contains the content of the page. Searching the source for “mp3” will help you locate the filename. Together the absolute path to the example file is http://www.multimediastandards.org/grid_dir/audio/Keith_Jenkins_Q01_LS.mp3. 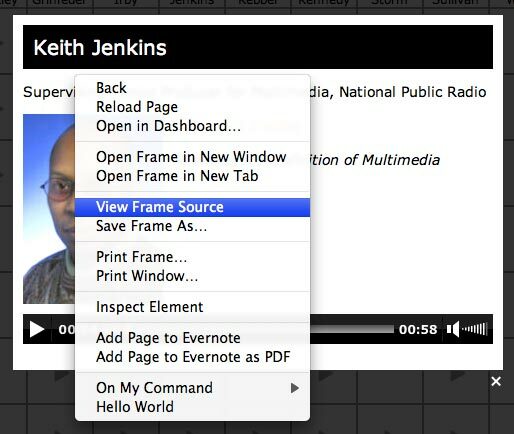 ← Interactive Group Brainstorm: What is Multimedia Journalism?